Happy December 26th, Inspy Romance readers! I hope you all had a lovely, safe, happy day yesterday with family and friends. We had a Christmas brunch at church followed by a Christmas morning service. My daughter and I worked in the nursery so we weren’t able to hear the message, but we did get to play with some toddlers and preschoolers. And I was able to feed a little boy his bottle. Haven’t done that in years, and we all know there’s nothing quite like cuddling up with a baby while you’re feeding them. I’m going to guess that some of you are like me and ask for books for Christmas gifts. Am I right? Every year my wish list is pretty much one hundred percent books, and this year was no different. So I thought we’d play a little game. I’m going to list books I received for Christmas and some books I’ve bought in the last few months. If you were given any of these books for Christmas, you get two points. If you’ve read any of the books I mention, you get one point. And the two people with the most points can have any one print copy of my three books as a prize. How’s that? Here’s a picture of the books I was given. Isn’t it a great group? It’s My Hope Next Door by Tammy L. Gray, Bride of a Distant Isle by Sandra Byrd, Conspiracy of Silence by Ronie Kendig, Since You’ve Been Gone by Christa Allan, As Waters Gone By by Cynthia Ruchti, and Just a Kiss by Denise Hunter. I haven’t had a chance to dive into any of these yet, but I’m pretty sure I’ll be doing some reading today. Which I’m excited about. Have you read any of these? There have been a number of good books that released this fall, and I snagged a good handful more when I was able. Again, I haven’t read all of these yet, but these are on my to-read-very-soon list: Unseen Love by Nancy Kimball, Forest Child by Heather Day Gilbert, The Promise of Rayne by Nicole Deese, Lady Ever After by Tamara Leigh, and The Thirteenth Chance by Amy Matayo. Let me know in the comments if you received any of these or if you’ve already read them, and please share any other books you might have received for Christmas. Talking books with reader friends is about as fun as it gets, I think, and I’m always on the lookout for a good read. How about you? I used to get books for Christmas… and love them. And now I only get baby stuff (being pregnant and all). I did get a few books in the weeks leading to Christmas (some from the authors of this blog, like A Marriage Worth Waiting For by Debra Lynn Collins and By Grace Draw Near by JoAnn Durgin) and I’m looking forward to read them, but I realize I still have way too many more books than I have time to read. I do like your game idea, even though I haven’t heard of many of the books you’ve got. It sounds fun. There’s nothing like entering the new year with a good book. Priscila, congrats on the baby! That’s so exciting. I hope the end is near? Those nine months feel like forever when you’re the one having the baby, don’t they? Thanks. I have two more months to go. I’m excited and trying to fit a lot in these two months. Quite the opposite. I could use some energy rush though. Happy Holidays and Blessings for 2017, Sally. My family never has given me books, because as an avid reader they never knew which books I already have or have read. For St. Nikolaus Day (December 6) I received an Amazon Kindle Gift Card. For Christmas I received an iPad Pro, so I can read all my books and emails, play games, listen to music, and take lots of pictures of my grandchildren. 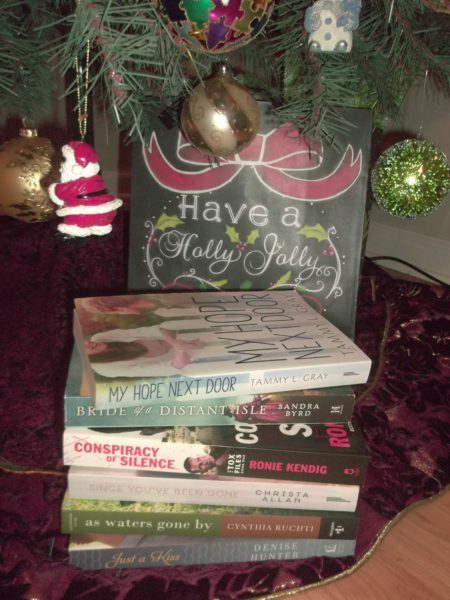 This year I received at least 10 paper backs from authors I follow through blogs and Facebook, plus an Advent Calendar, a gift card, and ebooks to review or as gifts. God is good. Great game idea. Unfortunately my score is ZERO. In the last month, I did read A Place to Call Home by Merrillee When. Ruta Sepetys’ historical novel about WW2, East Prussia, and the sinking of the Wilhelm Gustloff had the most impact, since my mother was living in East Prussia and fleeing the Russians to freedom in January 1945. Another historical novel is Book of the Night: The Black Musketeers by Oliver Poetzsch. I hope you enjoy your new iPad Pro! Renate, I certainly hope you enjoyed A Place to Call Home. Wow, Renate. What a story your mom has! I’m sure, though, it must have been hard for her to talk about it. I’m rereading Bodie Thoene’s Vienna Prelude right now (it’s been a few years since my last reading of it), and I feel like I’m seeing brand new how wicked and evil those countries were in that time period. Quite a unique period of history. Congrats on all the free books! And have fun spending that gift card! Valerie Comer yes I am enjoying my iPad Pro – the resolution is so much better than my iPad 3. Better camera. Still becoming familiar with all the new features. Merrillee Whren I enjoyed her book. Sally Bradley I read Vienna Prelude a few years ago. Yes, so much destruction of property and lives during those terrible times. My mom’s faith got her through those trying times. My dad wasn’t a believer at that time, it somehow he also got through and never was bitter. Learned so much about integrity, determination, and perserverence! I bet they did–and you too from hearing it. I’m thankful we don’t have that going on right now, but God does know how to use things like that to make us better, doesn’t he? My score is zero also. I don’t usually receive books . I’ve tried asking for gift cards for books, but my family doesn’t do that either. We had fun visiting my sister and skyping our kids. We all Skyped from my sisters house, so all the cousins were able to talk. Technology is wonderful for something like that. Yes, technology is wonderful! How fun that you got to be with your sister on Christmas. My family is a day’s travel away, but we had a good time being at home with our kids. Family always makes Christmas extra special, doesn’t it? I came up with a zero, too, even though as an IR blogger I’m not eligible to win. No one gives me books for Christmas – I read too much and too quickly for anyone to keep up with. Too much and too quickly for *me* to keep up with sometimes as well! I see a book bandied about and pop over to Amazon for a closer look only for them to tell me what day I’ve already purchased it! Oops. Occasionally I’ve even read it already. Sadly covers don’t stick in my mind because I read on a seven-year-old e-ink Kindle that doesn’t show the covers at all, not even in black and white. I’ve done that, too, Valerie–went to buy a book I already have. I just would like to be able to read more than I do right now. But that’s what Christmas break is for, right? Reading when I’m not writing? I used to ask for books, usually “how to write books” before I was published. Now the time I used to spend reading I spend writing. I am not a fast reader or writer, so I often wish I could have a clone, so one of me could read and the other could writer. :) The last book I received as a gift was the biography of Hamilton, the book the play is based on. I’ve read the first few pages, and I would love to finish, but the book is very, very long. It’s the thickest book I’ve ever owned besides the Bible. Merrillee, I hear you! I’m a fast reader but not a fast writer. I’ve also got a book like your biography–it’s the new book on Laura Ingalls Wilder that was the first book she wrote (but never published) and then later based her series on. I guess it’s the real story and more adult, but I’ve only read part of it so far. I’m loving it, but it’s a big book in format and thickness. Plus I feel like it’s one I’m going to savor in bits and pieces. So there’s no rush. I’ve read Just A Kiss by Denise Hunter, it’s really good. So I guess I only get one point. Gail, believe it or not, that puts you in the lead at this point in the comments! :D We’ll see if that holds up. Just a Kiss is actually one I’ve read now. So one book down, about eight more to read. Despite getting a lot of books for Christmas, and reading a lot of books this month, I didn’t get any points either! My aunt frequents book sales, and always gives me LOTS of books. Some are keepers, and others go back to the library for their next book sale :-) I’m embarrassed by all the books on my Kindle I haven’t read yet either. Happy reading everyone! As Waters Gone By is a favorite. I also enjoyed The Thirteenth Chance and The Promise of Rayne. I will definitely be looking at the others on your lists! I’m really looking forward to reading Cynthia’s book. I read The Thirteenth Chance already but not The Promise of Rayne yet. Although I did start it on Amazon and that is how it ended up on my Christmas wish list! Thanks for playing, Kate. Merry Christmas, Sally! I got a big fat zero. :( I have Just A Kiss by Denise Hunter loaded on my Kindle, just need to find the time to read it. No one gives me books for Christmas which is a good thing. I buy so many, I’d probably end up with duplicates. LOL, Jill. I’m a bit of a penny pincher, unless it comes to books, so I do tend to save up a list for Christmas and birthdays. My husband thinks it’s crazy that I’m completely satisfied with books, but he’s starting to believe me about it. I’m so glad you found a few new books to read, Megan. And thank so much for seeing if your library will buy them! That’s so very appreciated. I adore seeing my books in libraries. So what’s your favorite kids’ book? I love the board book The Big, Red Barn. My grandpa was a dairy farmer so that brought a lot of wonderful memories back to me. I’ve read My Hope Next Door, Just a Kiss, Conspiracy of Silence. I’ve also read The Promise of Rayne, and The Thirteenth Chance. It looks like we have similar tastes in books, Sally. Winnie, it does! I need to finish the book I’m rereading right now and then decide which one I’m going to read next. So many to pick from! I love it. I really enjoyed all 5 of the books I’ve read. It will be hard for you to pick. The Promise of Rayne is one of my favorites. Happy reading! I actually didn’t get any books for Christmas this year. My family is into giving B & N gift cards! Happy New Year!! I don’t read many “real” books these days; however, I do love to read on my kindle. So while I didn’t get any “real books”, my husband have me an amazon gift card :) I didn’t have nursery yesterday, but I was able to hold my 9 month grand-nephew during the service and he fell asleep in my arms – LOVE! I hope you enjoy the holidays and have a great 2017! That sounds wonderful, Julianne! I love it when they fall asleep on you. You have a wonderful new year too! Trixi, I’ve been eyeing that series by Susie. You’ll have to let me know how it is! I have read Just a Kiss by Denise Hunter, I received My Daily Pursuit by A W Tozer, for Christmas. I normally do not buy books but order books for my Kindle, I have over a thousand books on my Kindle. I love to read. I’ve learned to not ask for books. My family thinks I have too many already. Seriously, how can a person have too many books?! haha It’s OK, though, I am a big Kindle reader and library patron and have no problem getting my own books. Sally, from your new book list I have only read A Hope Next Door, which I loved. I’ve loved all of Tammy L. Gray’s books. Nearly all of the books you mentioned are on my own tbr list, but paperbacks of The Thirteenth Chance and The Promise of Rayne are literally sitting on my table waiting to be read next. I hope you can relax and read them soon. Enjoy! I agree–you can never have too many books. My husband is a pastor, and he spends more on books each year than I do. So he gets my book love a bit, even if it is all fiction. I haven’t read any of the books you mentioned, but I do have Just a Kiss on my TBR stack and I gave my mom the three books in that series for Christmas. I got The Lady and the Lionheart (Joanne Bischof) and Precious and Grace (Alexander McCall Smith) for Christmas. Melissa, I hope you’ve started The Lady and the Lionheart. That was my favorite book for 2016. So amazing! We’re going to close the contest now. Thank you all for commenting and playing! Winners will be announced on Sunday on the blog. SO excited to see my novel in your stack!! !